Is a Gluten-Free Diet Beneficial to Your Health? Learn about gluten and its effects on people with celiac disease. To respond to the Do Now U, you can comment below or post your response on social media platforms such as Twitter, Instagram, Tumblr, Vine, Flickr, Google +, etc. Just be sure to include #DoNowUGluten and @KQEDedspace in your posts. 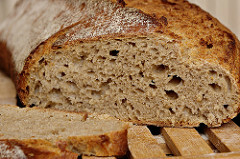 Bread made with wheat contains gluten. Do you make a point of eating gluten-free foods? According to the Institute of Food Technologists, “gluten is a protein that naturally occurs in a number of grains such as wheat, triticale, barley, rye and oats.” Gluten is actually a large protein formed from two smaller proteins, glutenin and gliadin. Gluten is formed when the two smaller proteins are hydrated and join together to form a new protein. It is responsible for giving bread its chewy texture and can be found in a wide variety of foods including everything from salad dressing to beer. 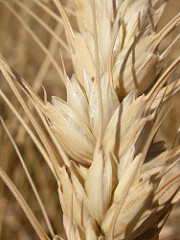 Gluten is a protein found in wheat. For some people, going gluten-free is an absolute necessity. Celiac disease is an autoimmune disorder that affects the body’s ability to process gluten; the body mounts an immune response that attacks and damages the small intestine, preventing it from absorbing nutrients. About 1 percent of the U.S. population has celiac disease. Some people who do not test positive for celiac disease still experience gluten sensitivity. While not an autoimmune disorder, people with gluten sensitivity may have gastrointestinal symptoms similar to those with celiac disease. In recent years, a gluten-free diet has become popular among people trying to improve their overall health status without the diagnosis of celiac disease or a sensitivity to gluten. Some first-person testimonials suggest that removing gluten from one’s diet can improve digestion, facial acne and headaches. Like cholesterol in the 1980s and fat in the 1990s, gluten has been described as “latest dietary villain, blamed for everything from forgetfulness to joint pain to weight gain.” Some people argue that it is not the removal of gluten from one’s diet that makes it healthy, but rather that the gluten-free diet promotes an overall conscious awareness of what is being ingested. There are health risks associated with a gluten-free diet for people who do not have celiac disease, including a decreased intake of vitamins and minerals, or an increased intake of calories, which can lead to weight gain. The increasing popularity of a gluten-free diet is evident in the number of gluten-free products now available to purchase, but the reasons behind ditching the protein are not quite as clear. Do you think eating little or no gluten is beneficial to one’s health, even without celiac disease or a sensitivity to gluten? This article outlines what celiac disease is, the reality behind gluten-free diet claims, and the risks of a gluten-free diet. This informational website explains celiac disease, and its symptoms, diagnosis and treatment. Gastroenterologists say sensitivity to a group of carbohydrates, called FODMAPs, may be mistaken for gluten sensitivity. Go here for best practices for using Do Now, using Twitter for teaching, and using other digital tools. This post was written by students majoring in nutrition at Lipscomb University. KQED Do Now U is a bi-weekly activity in collaboration with SENCER. SENCER is a community of transformation that consists of educators and administrators in the higher and informal education sectors. SENCER aims to create an intelligent, educated, and empowered citizenry through advancing knowledge in the STEM fields and beyond. SENCER courses show students the direct connections between subject content and the real world issues they care about, and invite students to use these connections to solve today’s most pressing problems. Like the introduction alluded to, the benefits for some people to maintain a gluten free diet even without having Celiac disease or gluten sensitivity, is the fact that it often constitutes a greater awareness of overall consumption. In this way, if a person consumes more fruit, vegetables and less processed food because of it, a gluten free diet can be extremely beneficial. That said, I think anyone considering to go gluten free needs to conduct adequate research before deciding to make the switch. As long as a person replaces gluten-free whole grains with the ones they have been consuming, and ensures they are consuming all other necessary nutrients that may be lost through the discontinued consumption of gluten, I believe the diet can be beneficial. A newer development to this topic is the fact that it has grown so much in popularity. With its growth, more and more products have gluten free options. While the fact that a person can now find a beyond-delicious gluten free chocolate chip cookie is exciting, it means that it is easier for people to simply replace their processed foods that do contain gluten, with empty calories and simple carbohydrates that no longer contain the protein. For people who have not been diagnosed with a gluten intolerance or sensitivity, their main concern should be eating a healthy diet. If going gluten free helps them achieve that purpose, then the diet has potential for benefit. I believe that it is great to be aware of what foods contain gluten and how the consumption of gluten in the diet can effect those with a gluten intolerance. Also, I think that it is awesome to be aware of the foods that you put into your body, but I personally would not choose to strictly cut all gluten out of my diet if I did not have a gluten intolerance. If someone did want to go on a gluten free diet, then it would be important to do adequate research on the subject before denying your body certain foods. I do not think that eating little or no gluten is beneficial to our health. I think that gluten should not be removed from your diet. Unless you are allergic to gluten or have Celiac disease, I think that a gluten-free diet is not necessary. I think that anyone who chooses to go gluten-free should make sure that they are still are consuming the nutrients they might have lost from removing gluten from their diet. Thank you for very interesting post! Thanks it I knew a lot about gluten diet. I think society and the health industry has made gluten look like the devil, when really it’s what kinds of food we are putting into our body, not gluten itself. Eating gluten free does not mean that you are healthier than someone who eats gluten, because there is just as much packaged and processed gluten free products as there are other regular processed products. Instead of eating gluten free, we should look to cut out processed foods with our diet and substitute with whole plant based foods. A lot of plant based foods and grains like quinoa, buckwheat, and brown rice are gluten free. People should be focused on eating more naturally occurring foods, which tend to not have gluten. We should still eat gluten and can enjoy sweets on occasion, because most people are not even allergic to gluten. Gluten is really not harmful to our health, but rather just the type of foods we are consuming. People need to look to nourish their bodies and treat them well by giving them whole foods, instead of cutting out gluten as a fad diet trend. I do not think it is advisable for those who do not have celiac’s disease nor gluten intolerance to eliminate gluten from the diet. By unnecessarily removing gluten, people are also cutting out common and nutritious foods from the diet and placing themselves at higher risk of nutritional deficiencies. I have to agree that removing gluten from the diet without necessity is probably not a great idea. I can see why a lot of people may think that making this transition in their diet can lead to some positive results since gluten is in a lot of foods–even some unhealthy ones. So by eliminating gluten altogether people will eliminate those unhealthy foods. However, they could also be losing a large amount of vitamins and nutrients that their bodies need and won’t get otherwise. In short, I think that gluten should only be avoided if completely necessary. Three of the people in my family are allergic to or have a sensitivity to wheat and gluten. I sometimes eat items with no gluten, but try not to eliminate it from my daily diet. I understand why people might think removing gluten from their diet is healthy, but they probably don’t know all the vitamins and minerals they can lose, or that they could be having a greater intake of fat and sugar. My family members and i all agree, there’s are plenty of options to eat healthy other than get rid of wheat and gluten. Though each person is different and one diet may work better on one person as compared to another person. So I think it would just depend on the person. I have always had a sensitive digestion my whole life. I never knew people did not have the trouble I had. Eventually it got worse and worse, even when I mentioned it to a physician I rarely could say if “something” had caused it, because I ate “healthy”, and I ate the foods that were recommended for good nutrition. I never saw a physician that seemed to think it was a problem. Over years I removed dairy, then wheat, eggs, and all onion family foods, I always avoided beans, and just did not enjoy eating a few others. I am now so sensitive to these that I can rarely go out to eat, even garlic in dressing or marinade bothers me. It is only recently that read about FODMAP foods, the list reads a lot like my “avoidance” list. I think its sad that so few Doctors have enough background in nutrition to notice when their patients have a problem. I think that the results of a gluten-free diet depends upon the person and his/her body. It also depends on what types of gluten-free foods the person is eating, and if he/she is eating enough fruits, veggies, and taking vitamins. Many gluten-free products can be high in calories, fat, and carbohydrates. They can lack vitamins, minerals, and essentials nutrients that your body needs. Going gluten-free can actually make you gain weight, or become ill from the lack of vitamins and increased carbohydrates. If you decide to go gluten-free you are going to have to make changes to every aspect of your diet, and experiment with different types of food to see what works best for your health. In my opinion, I do not think that going gluten-free is beneficial to your health unless you have celiac disease. I personally would not go gluten-free unless I had to. I would not recommend the average person who does not have Celiac disease or food sensitivities go on a gluten free diet. It is a very restrictive and expensive diet. Most Americans are not getting enough Fiber and certain nutrients daily. Removing an entire food group and processed food products that are fortified could lead to nutritional deficiencies and create medical issues later on. If you are knowledgeable about the diet and can meet the daily requirements for fiber and vitamins then I think one could try it. Other then the possibility of getting clear skin and reducing headaches there are no additional health benefits to a gluten free diet. a Jug of Liquid…. thats what we have? Until more proof supporting the ill affects of gluten is substantiated, I believe we have to go by what we know now: not eating can sometimes be worse for your health. Many unhealthy ingredients can be added to foods to replace gluten, and really if you don’t have a health problem with digesting gluten it makes no sense to be gluten free, unless you like the food better which would be very surprising, but to each their own. Part of the issue is that EVERYTHING contains gluten now! Things that absolute should not ever contain gluten, such as: salad dressing, pasta sauces, mayo, ketchup, chili spice mixes….I could really go on! It is because of this that I (and many others) strongly feel that we have so much gluten issues now. Some gluten on occasion for people with no health issues is fine. However, the super refined gluten of today is still one of the worst things you can eat on a regular basis because all the aspects of the grain that make it easy for your body to digest have been stripped away. This causes inflammation in your body. You may not readily see it, but it is happening. I knew for years that I had a sensitivity, but still ate it sometimes. However, after being diagnosed with MS in September, I make a very strong effort to stay away from it entirely. It wrecks havoc on my body when I eat too much or even too much grain in general. Like all things in life you should show moderation! I definitely do not think that a gluten free diet is the best option for those who aren’t having their insides destroyed by it. I personally went through I time where something I was eating was making me feel incredibly sick, and tried cutting out gluten because I kept hearing how terrible it is for your body and that it’s not something humans should eat anyway. I ended up feeling even worse after a while because, like the video stated, I was really missing some of the essential vitamins and nutrients I should’ve been getting. It was also dairy that was trying to kill me anyway. That said, I certainly support the growing market of gluten free offerings as I know multiple people with celiacs, so the ever growing availability of those foods, as well as the increased desire to actually make them taste good, is really incredible. So in all, I really think that a gluten free diet is not the best choice for those who don’t have to choose it, there are much better and much healthier options available than completely removing such a huge part of what is eaten. Today there is a lot of variety of gluten free food to choose from, but those can be quite expensive. At the same time, if you have any level sensitivities to gluten, keeping track of the amount of gluten you intake is important to avoid all sorts of discomforts. To some people eating gluten-free or just less gluten is a trend or a diet but for others it is essential to their well being.